Mitchell County was fortunate to have lost only four soldiers in what has been called the “Great War” or the “War to End All Wars.” However, the memory of those four young men is a reminder of the tragic loss of life suffered across the state and nation. It also commemorates the sacrifice of individual service personnel and their families that is necessary to preserve the ideals of American Democracy. Wess R. Ellis or Wesley Reuben Ellis, from Clarissa, was the son of Sidney and Jane Cordelia Buchanan Ellis. He registered for the draft June 5, 1917, was initially assigned to the U.S. Army Company B 120thInfantry and sailed on theWinifredian from Boston July 16, 1918. He apparently was reassigned later to Company B 119thRegiment and killed in action on September 26, 1918 in the lead up to the Battle of Saint Quentin Canal near the village of Bellicourt, France. It appears that his body was returned to the US aboard the transport ship Sommeon April 22, 1921, which left Antwerp, Belgium and arrived in Hoboken, NJ on May 6, 1921. It is believed that his body rests in the Ellis Cemetery on Cane Creek. 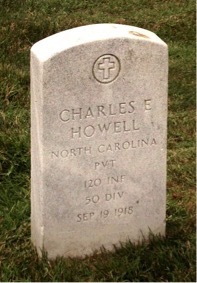 Charles E Howell was the son of John Wesley Howell and his stepmother Lucretia Horton Howell of Huntdale. He registered for the draft in Burnsville the same day as Wess Ellis did in Bakersville, was assigned to U.S. Army Company D of the 120thinfantry, and left Boston May 12, 1918 on the Bohemian. He was killed in action September 29, 1918 during the assault on the Saint Quentin Canal at Bellicourt, France. He is buried in Arlington National Cemetery. 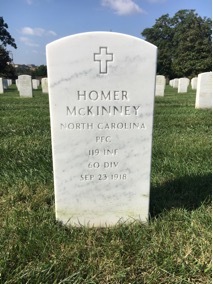 Homer McKinney of Toecane, son of Isaac and Mary Emma Young McKinney, signed his draft card the same day as Ellis and Howell, went to Camp Jackson, and was assigned to US Army Company M of the 119th Infantry. He died September 23, 1918 apparently on route to Saint Quentin Canal and was first buried in the American Cemetery, Bony Aisne, France, then reinterred April 28, 1921 in Arlington National Cemetery. William Floyd Ramsey was the son of William Ramsey and Alice Felts Ramsey from Bakersville; he registered for the draft on the same day as the other three and was assigned to US Army Company A 318thInfantry Regiment National Army. He sailed from Hoboken, NJ on May 2, 1918 on the Leviathanand according to his grave stone died November 5, 1918. His body left Calais, France on February 27, 1921 and arrived in Hoboken on March 14, 1921. He apparently died of an undetermined disease; the flu raging at the time is suspected. His resting place is believed to be Bakersville’s Penland Cemetery. Special thanks to Jonathan Bennett for his input for this piece. If anyone has additional information related to these or other soldiers from Mitchell County who died as a result of their WWI service, please contact the Mitchell County Historical Society. MCHS in collaboration with the NC Department of Natural and Cultural Resources is participating in the national program “Bells of Peace.” This is a call to citizens and organizations across the nation to toll bells in their communities 21 times at 11:00 AM local time on November 11, 2018 as a solemn reminder of the sacrifice and service of veterans of First World War as well as all veterans. We especially would like churches in the county to set aside time to participate, not just to ring their bells but also consider a special prayer service for the 116,516 who died in WWI, all veterans, and those currently serving in our armed forces.